Those Girls is a dark, nail-bitingly tense page-turner of a story with violence towards women at its heart and the bond of sisters, secrets and the long-term effects of trauma. It is a fast-paced psychological thriller from beginning to end. It’s very difficult to review this properly without giving too much of the plot away and I don’t want to spoil it for anyone. The emotional response of the reader to the horror of what is happening on the page and how the characters are coping with it are the focus of the story rather than a complicated plot. The book is split into two parts starting in 1997 and initially told with a sense of retrospection as if looking back. The second part, set in 2015, is more immediate. Set in Western Canada, Dani, Courtney and Jess Campbell are sisters who have lost their mother to cancer. Their father is struggling to cope with the loss of his wife and is drunk most of the time and violent with it. Fortunately their father works away a lot and the sisters struggle to survive alone on the ranch with what little money he gives them. The catalyst for the novel is the day violence gets out of hand and leads to fifteen year old Jess shooting her father. 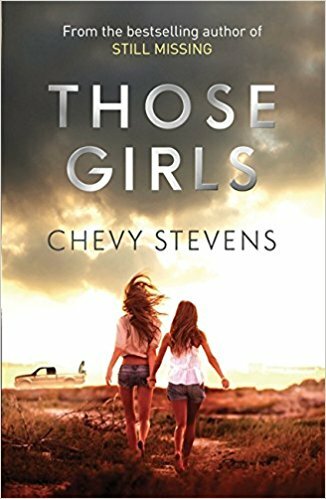 The girls go on the run but when their truck breaks down in the small run-down town of Cash Creek the girls find themselves in far worse danger and fear for their lives. Eighteen years on, although the girls have changed their names and created new lives for themselves, they are still struggling to cope with what has happened. And when one of them goes missing everything starts to go wrong again and it looks as if this time the outcome will be even worse. Chevvy Stevens really gets across a sense of place with the isolation on ranches and what can happen when there is no one around to hear you scream.